The Overlay tool in Polarr allows you to stack images or effects on top of a base image. This tool is how you'll be able to superimpose two images together or some of the preset overlays and their effects with Polarr. Effects available in Polarr like light leaks, clouds, and the weather should be pretty self-explanatory. 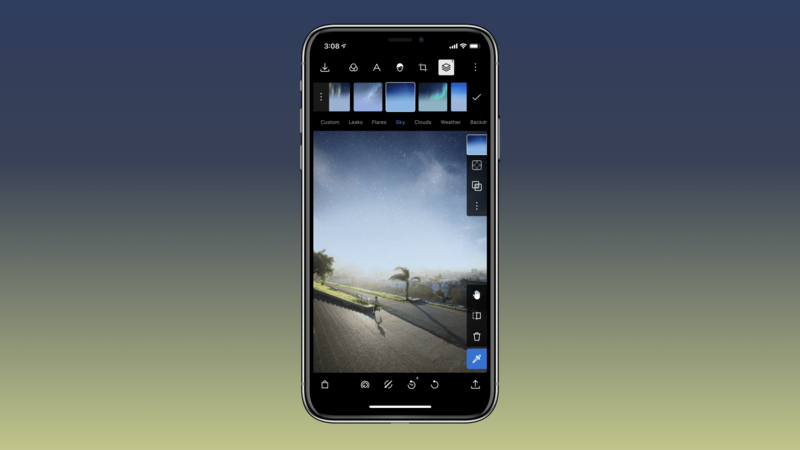 These allow you to add the effect to your images with just a few taps. Other effects like gradients and duotone are a little more complex, so we've given them their own entry in the wiki. Learn more about them by checking out their pages. Look for the icon with what looks like three stacks of paper if you want to access the overlay tool. It's in here you'll the overlay tool and all of the effects you can apply to your photos. You can tap the … (All) to view all of the different effects included in the overlay tool. Custom is where you can see and add your own images. Otherwise, scroll down to see all of the different effects in the app. Once you tap an effect it is applied to the image. Once you've selected an effect or image, you can manipulate it to your artistic style. Use your fingers or mouse to reposition the image and resize it. Once you've done that, you can change the opacity of the layer and the blending mode. You'll find most blending modes you could need like normal, brighten, darken, contrast, and transfer. That's it! Click the little check mark to confirm your edit and you're done. Play around with the tool to get familiar with it. You'll notice most options for manipulation are the same, but gradient and duotone have a few more options unique to those effects. You can add your own custom overlays to Polarr. Adding is straightforward, just click on the custom section of the overlays and click the add button where you can import your own overlay. Once added, you can edit and manipulate it like any other layer. Deleting a custom overlay will require a long-press on the custom overlay on iOS or Android to bring up the option to delete. Desktop users can right-click to one of their custom overlays to delete it.